Indications: Vitamin and Stomach Association. Acts as neurotonic, energetic and antitoxic muscle. Especially indicated in the preparation of the sports equine. Stimulant of muscular blood flow and active coronary vessel. In exhaustion, stress, surgery and cardiocirculatory disorders. Prevents exhaustion of exercise. Bottle 1: ATP INDUVET powder 200mg. Vit ,. 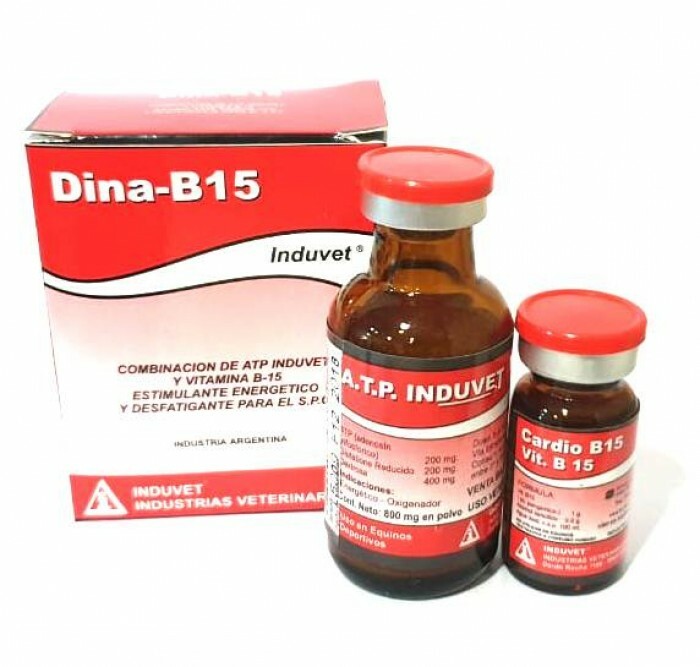 B15 (pangamic acid) 100 mg.
Distilled non-pyrogenic water csp. 10 ml. Dosage: (preventive or therapeutic) Mix the contents of both bottles and once reconstituted the product, apply 10ml. By intravenous or deep intramuscular route once a day, for 5 days or as directed by the veterinarian.